How to (quickly) define or change the keyboard shortcut in FreeCommander? 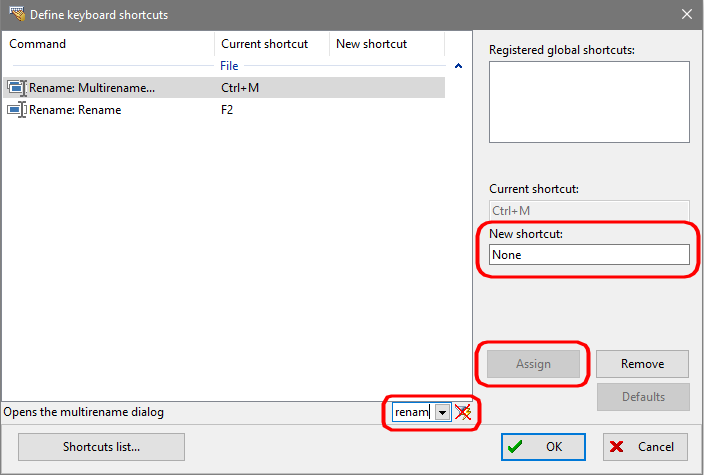 To define or change the keyboard shortcut, go to main menu “Tools → Define keyboard shortcuts…”. To quickly find the command, use the filter field, type the keyword of the command you search for, or just the part of it. Click within the “New shortcut” field, press your desired keyboard shortcut, click the “Assign” button, then “Yes” for the confirmation dialog (if needed). How to refresh view in FreeCommnder, or set F5 key to refresh view, as in Windows Explorer? Activating the main menu item “View → Refresh” or the shortcut “Ctrl+R” refreshes the contents of the active panel. Activating the shortcut “Shift+Ctrl+R” refreshes the contents of both panels. To change the shortcut to F5, remove first F5 from the copy command then go to main menu item “Tools → Define keyboard shortcuts…” – find the “Refresh all” command, click the F5 within the “New shortcut“ field and press the “Assign” button and then “Yes” for the confirmation dialog. You’ll need to assign a new shortcut for “Copy” command, if you want to use it.